Felix from Gurney's shows off the difference in the fruit production on a thinned and a non-thinned tree. 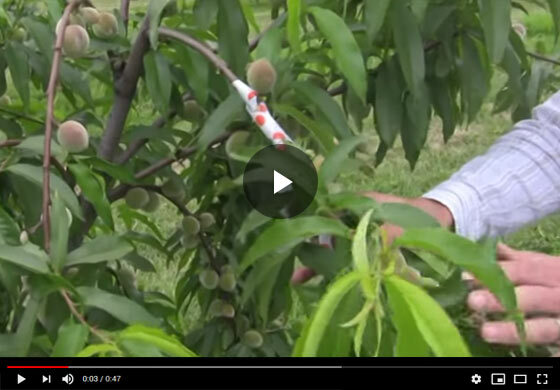 Witness how thinning affects the fruit size and overall yield. Alight, hi everyone, here we are just about four to six weeks after we thinned these peach trees, and this is our thinning versus non thinning, same variety of peach, and you can see here how they're sizing up. This is our thinned peach tree here and we've left a nice six inch spacing here between where the fruit is on the branch and you can see how nicely it's sized up for us and they have some really nice size here for that duration after fruit set, and we can walk right over here to the other tree that we did not thin and you can see we have some nice clusters here, just the density of fruit, and that's what we had on the other tree when we thinned when they were thumb-sized, and you can see they really haven't expanded much at all compared to the nice big fruit. We just looked at on the main tree, we're going to continue to let this go so you can see the limb breakage you got and when the fruit is nice and ripe, exactly the difference between a thinned and a un thinned fruit. So join us for that video where we'll show you the results.